Integrated interiors means taking a holistic approach to the workplace to create the best possible result. By integrating furniture, technology, architectural products and flooring, we can create dynamic, high-performing work environments. You get a thoughtfully integrated design up front, a streamlined implementation that delivers cost savings, and the ease of dealing with a single vendor. See how the four segments of integrated interiors combine to create a flexible, holistic work environment. Demountable walls, modular power and data, and sound masking create flexible spaces that can adapt as you need and support privacy within the open plan. 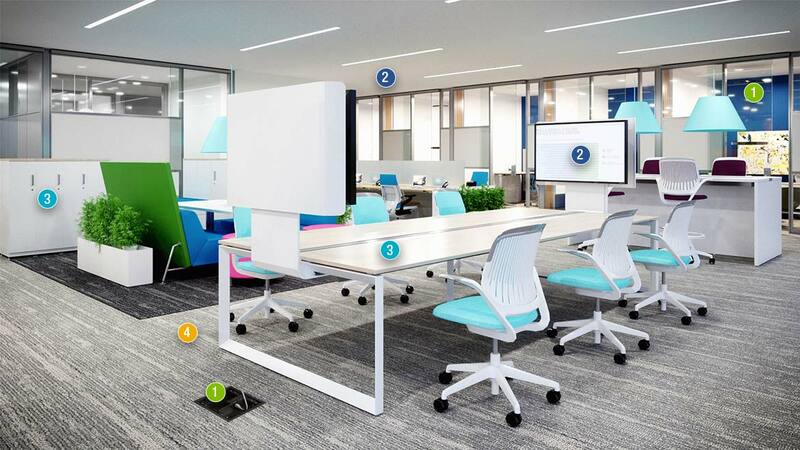 High performing environments feature integrated collaboration solutions that support productivity and creativity. Network cabling, lighting, and electrical services support workplace environment infrastructure. Furniture settings support collaboration, privacy and wellbeing to create a palette of spaces throughout the floorplan. Custom furniture solutions meet unique needs in fit, finish and price. Durable and beautiful floor coverings bring your spaces to life. By offering an ecosystem of spaces, your people can choose the best setting for them to do their best work, as well as remain engaged. Want to learn more about creating integrated environments? What is a Resilient Workplace?